One of the activities on Compuserve that I had a wonderful time with was Round Robins. This was a bit different than the progressive quilt that I posted about here. Joining a Round Robin was again a first for me. 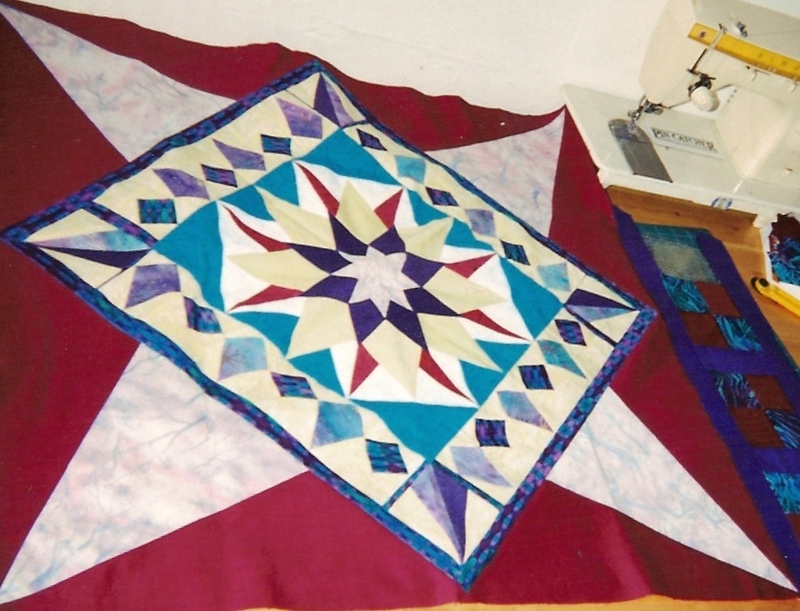 Seems I was getting a lot of firsts during my membership in the Compuserve Quilting Forum. I signed up and before I knew it, the organizer, Kay, had put me into two groups. Yes I know, I know. That's a lot of work. However, Kay was short one person for an international group and I just couldn't say no. So, I was listed with two groups the “Parrots” and the “Cranes”. There were a total of 9 groups of 5 members each, and carried such names as “Sparrows”, “Swans”, “Doves”, “Blue Jays”, “Cardinals” and “Peacocks”. For both round robins, I used a block called Sea Lily for my centre block. However, as you can see I used a different colour palette and placement of dark and light values in each block so they looked entirely different even though they are the same block. 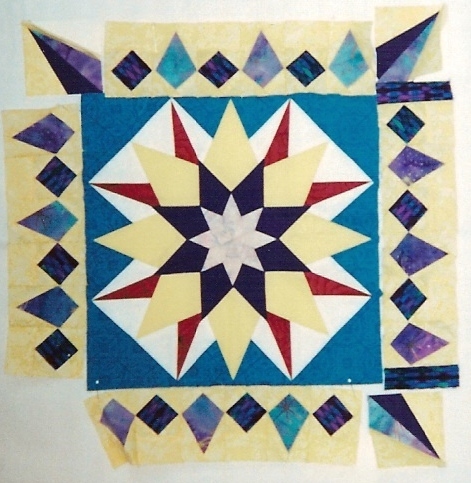 The pattern came from Jinny Beyer’s Patchwork Portfolio. The one on the left was used for the Parrots round robin, while the one on the right for the Cranes round robin. For this post I'm going to show you the progression of the Parrots group. From the block on my makeshift design wall to the end product. Next my block was sent along with some additional fabric to Linda in Vermont. 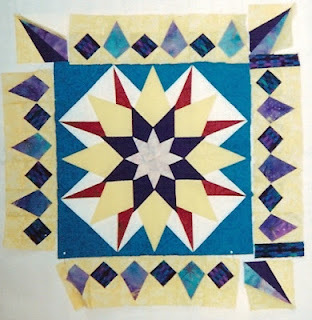 She added a triangle border to my block, incorporating equilateral triangle and "on point" squares. Very ingenious. Dave in New York received it next, placed the block on point and added add a 2 to 4-inch border consisting of squares. At the time I was surprised that a man took an interest in quilting. I know better now. I think he did a wonderful job. 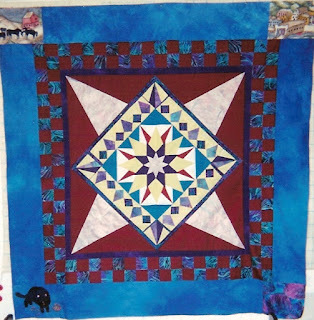 Last but not least the block, now quilt top was sent back to New York to Charlotte. Her task was to add appliqué to the top. 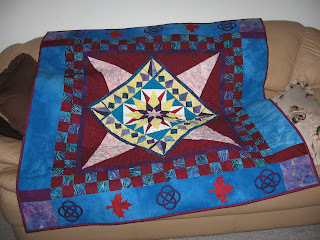 She chose to add Celtic knot work to the blue border that Marge had attached. I decided that I did not like the corners that Marge had put on the quilt (sorry Marge) and changed the corners to make a more cohesive result. Here is the finished quilt. It now resides with my uncle in Germany. a great story for a quilt! round robin quilts are such fun. Love your starting block. You got some very wonderful borders on this one, and I have to say, I like your revised border much better than the original, although I can well image how hard it would be to meet that border request! The finished quilt is wonderful, and I bet your uncle loves it.